Quick sidenote: The fantastic pics with a (*) were taken by Robb McCormick Photography. After a promising second place finish in the 2013 Aruna 5k, I decided to test my legs in a longer race to see if I had improved enough to seriously train for a potential Boston qualifying marathon time. In looking for upcoming 10ks nearby, I came across the 2013 Buckeye 10k Classic, checked my calendar, and put down my race fee. With this race taking place only a few weeks after the Aruna 5k, I felt like I had just enough time to recover from somehow running one of my fastest 5ks, and get my body ready to push for twice that distance. 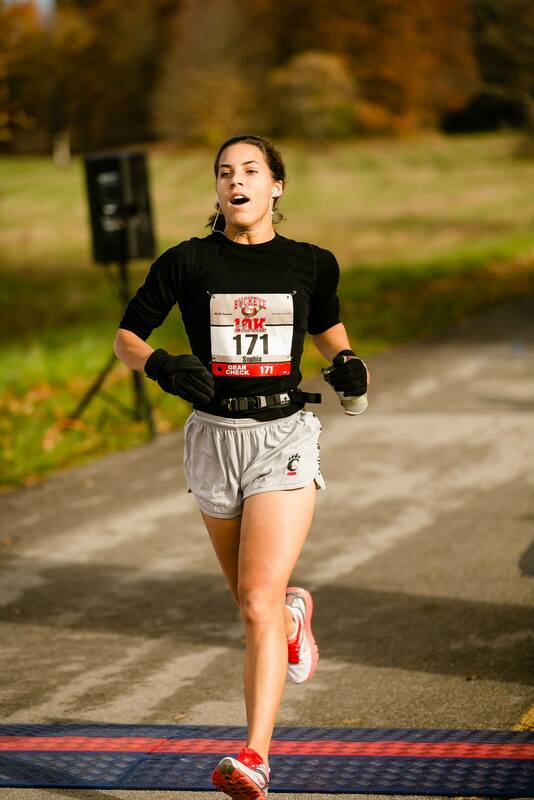 By the time I found myself driving to Columbus, Ohio for race weekend, I felt energized and ready to go! The morning of race day went smoothly. With the temperature being borderline for long sleeves (40 something degrees), I decided to run with my UC running shorts, Smartwool top, earwarmers & gloves. I’m weird in that I love to be really cold when I’m being active or sleeping, but can’t stand it otherwise. Anyway, I filled my water bottle, indulged in my pre-race tradition of eating nothing, and made my way to Highbanks Metro Park. M3S Sports (the sponsor) did a great job of having an organized bib pickup for the race morning! There was music and a pretty lively atmosphere at the starting line which was fun. I didn’t really know anyone there (Nick was supposed to come run with me but something came up), so while I waited for the start of the race I thought about what my strategy would be. For starters, I had been so busy during the weeks leading up to the race I had forgotten to look at the race map. So I figured I’d start slow at around an 8:30 pace, and then speed up after the first couple miles when I felt ready. Considering the hilliness of the surrounding area I wasn’t sure what pace I’d be able to hold for this 10k (my last fast 10k was in the complete flatness of Santa Monica/Venice) but the fact that I did well in the Aruna 5k a few weeks before which had been super hilly was encouraging. The first mile of the race felt great! The air was crisp, my legs were fresh, and I trotted along with everyone around me at a nice pace, trying my best not to get too excited and start too fast. One of the main perks of this race was the scenery! Running through a dense forest park in the peak of fall meant all of the trees were in full color. Fall is my favorite season, so I basically spent the whole mile gazing at the jaw-droppingly-gorgeous trees and thinking about pumpkin flavored everything. Fall – the season where my white half shines right on through. I don’t even care. Pass the pumpkin. Of course I successfully hid from the photographers at the most beautiful photo spot, so here’s a picture of someone else in that spot. He will probably never read this so it’s not that creepy. Plus this guy has an Ohio State afro on, which makes things that much more exciting. After passing the lovely photo-op spot, to my surprise everyone crossed the street and ran into the woods. Which would not have been alarming had I checked the course map. 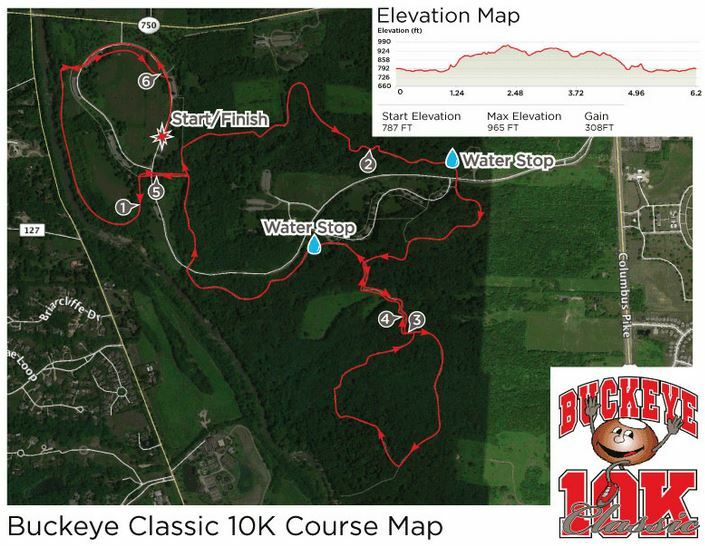 Turns out the Buckeye 10k is a trail race. For my non-runner friends, trail running and road running are definitely related, but still kinda different. For one, roads don’t have the crazy steep grades trails can have, which makes trail running more difficult and trail race times (generally) slower. Trails are full of roots and oddities that the smooth road lacks, meaning not only do you have to pay more attention to where you’re putting your feet, but also those strong ankles are going to need trail shoes with adequately-sized grips on the feet below them. I looked down at my road shoes, hoped for the best, and followed everyone into the woods. For the first few miles, trail running wasn’t all that bad! It was hard to go between making sure I wasn’t about to twist an ankle (plus my shoes kept sliding) and enjoying the scenery, but I felt like I was managing that pretty well. Around mile 2 things started getting hilly, and my legs, which weren’t really warmed up yet, began to complain. We wound through the gorgeous trees and I willed my legs to just be quiet, which worked well until we got to about mile 3 where we had to run up stairs. IN THE MIDDLE OF THE RACE. I don’t think there were all that many stairs to be honest, but at this point my legs were definitely not down for what felt like scaling Machu Pichu right in the middle of a 10k. Seriously this crap happened in the middle of a race. I was not prepared. STOP. NO. THIS HURTS YOU CRAZY PEOPLE. So the stairs happened, and I got to the top and continued on. One thing I was proud of though was not having to stop and walk during the race! I thought about it quite a bit since I had thrown my time plans out the window, but ultimately decided to put in as much effort as I could and maybe still have a good pace. I got surprised another two times by staircases before that crap was finally over, and by mile 5 we were crossing the road back onto the paved portion of the race! Woohoo! I was still feeling pretty defeated by the hilly trail, but tried my best to take advantage of the smooth flatness of the path. My stride opened up a bit and I pushed on to the finish! I finished with a time of 48:26, which wasn’t too bad considering it was (mostly) a trail race. 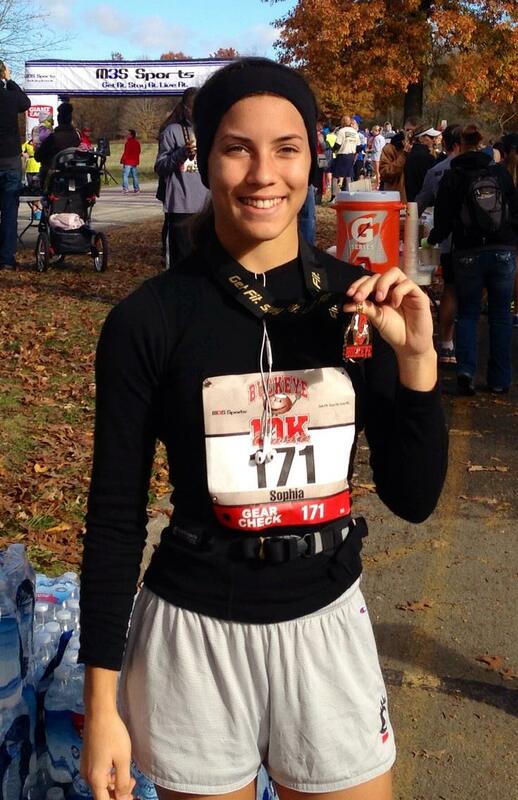 That time put me in 5th place for my division, and 7th place overall for the women! I settled down with a banana and watched more people cross the finish line while I cooled down. I love the finish line of races, because they have so much positive energy and happy, cheering people. 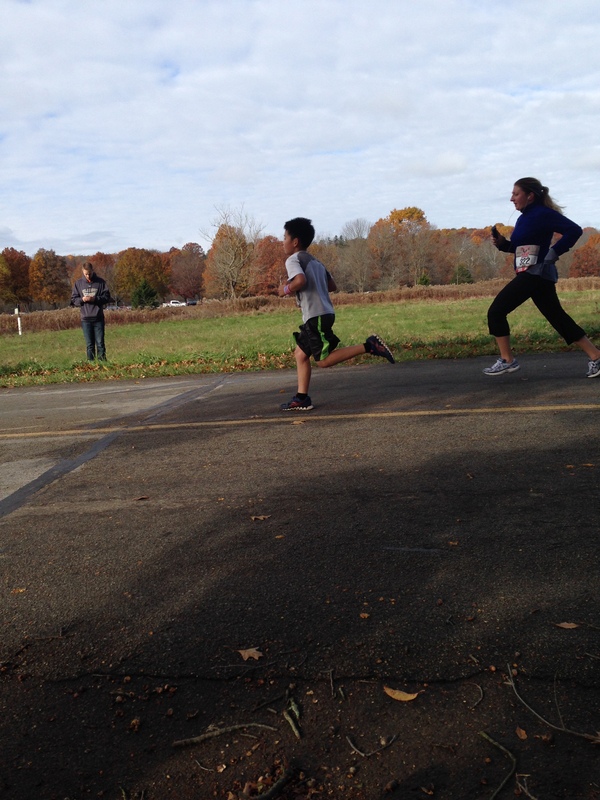 I also saw this kid give his all in the final stretch which was completely adorable. THIS IS SO CUTE OMG!! So overall it was a great race! I did well and figured it would definitely be worth a shot to push myself and see how much I could improve my marathon time for the KY Derby 2014 Marathon. Here I come, Louisville!